Since the end of the 2018 MLB Season, the Seattle Mariners have made a flurry of trades to get rid of some pricey contracts, avoid having to commit long-term and attempt to restock their farm system. It started with a trade of Mike Zunino to the Tampa Bay Rays for Mallex Smith and Jake Fraley. Smith is a pretty solid return for a catcher with a .207 career batting average. Sure, Zunino has 20+ HR power, but Smith has the potential to hit .300 at the top of the Mariners batting order and stole 40 bases last year with 39 XBH. Paxton just recently turned 30-years-old and pitched a career-high 160 innings in 2018. He struck out 208 batters, walking 42 and lowered his career WHIP to 1.19. He allowed a career high 23 home runs and now will make his home start at Yankee Stadium, which ranked sixth in Runs/HR according to Park Factors. Safeco Field saw the 4th fewest runs per game and in the middle of the pack in HRs allowed. When Jeff McNeil was rumored to be a part of this deal and there was no mention of the Mariners sending 20+ mil to the Mets, I was not a fan of these deal as a Mets fan. Kelenic has superstar potential, and Dunn was also recently selected in the first round, but with Jacob deGrom, Noah Syndergaard and Zach Wheeler in the prime of their career, new GM Brodie Van Wagenen is in win now mode. Diaz has saved over 100 games for the Mariners in the last three seasons, including 57 last year! In 191 career innings pitched, Diaz has 301 strikeouts to 64 walks with a 2.64 ERA and a 1.02 WHIP. The Mariners wanted to get rid of Cano's contract so bad, that they were willing to deal a dominant closer, who will turn just 25-years-old prior to Opening Day. 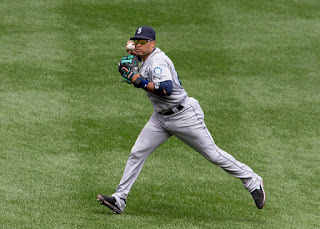 Cano is owed $24mil for each of the next five seasons, until he turns 40 in the year 2023. We all know what he is capable of doing offensively. Another day, another big trade for the @Mariners. The latest agreed upon trade sends Jean Segura to the Philadelphia Phillies. Carlos Santana and J.P. Crawford will be wearing a Seattle Mariners uniform in 2019. Segura hit slightly better than .300 in his two seasons with the Mariners, with 59 doubles, 21 home runs and five triples over 637 ABs. The Mariners acquired him after the 2016 season, sending Ketel Marte and Taijuan Walker to the Arizona Dimaondbacks. Segura hit 41 doubles and 20 home runs in 2016. In Carlos Santana's only season with the Phillies, he his 28 doubles and 24 home runs, but hit just .229. His OBP was above .350 though. He had a down year compared to his career averages, despite playing in a hitter friendly ballpark. Santana had signed a three-year $60mil deal last offseason which includes a 2021 option for $17.5mil. However, he failed to include a no-trade clause in the deal which could have prevented this trade from happening. Currently, the only Mariners in the lineup from last years team are Mitch Haniger, Kyle Seager, Ryon Healy Ben Gamel and Dee Gordon. Rumors are that Seattle is looking to deal Seager too. You can add Mike Leake to the trading block as well.